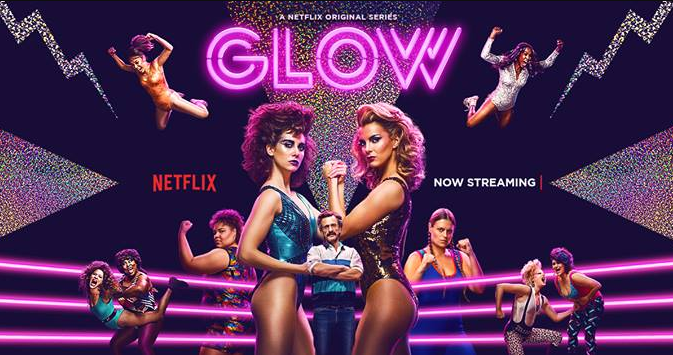 GLOW #Review – Binge It. I’ll be completely honest with you. Friday morning when I started watching GLOW on Netflix, I had zero interest in it. I was watching simply because I was curious what Alison Brie has been up to since Community and because it was written by Jenji Kohan who has done fantastic work on Weeds and Orange Is The New Black (Season 5 of which came out earlier this month). But by the time I finished Episode 10, in one of the fastest shows I’ve binged in a long time, I was hooked. It’s the 1980s finding good acting roles for women was near impossible. Secretarial roles seemed like the only thing Directors were casting for. But then came the crazy idea of GLOW. The Gorgeous Ladies Of Wrestling are aiming to be the newest cable TV show, to counteract the men and Hulk Hogan. Sam: You don’t think wrestling is acting? Ruth: It’s not. Is it? It’s more like a sport, with costumes. Are you hiring actors to be wrestlers? Or are we the wrestlers? But while Ruth is the center point of our Netflix show, it’s Betty Gilpin’s Debbie that will pull you in. At first she is a doubter, like I (the viewer) was, but as she learns to believe as do we and get pulled into the wrestling world. I think that at times Gilpin’s acting leaves a lot to be desired…but her strong moments are really strong, while Brie and the rest of the cast are tag teaming other shows into submission. Sam: Why’d you hire me? Bash: Your movies are hilarious. Marc Maron (of the WTF podcast) is the on-screen sexist Director (Sam), and I think Britt Baron is silently great and a rising star. It’s tough for me because I generally hate to pick out people from a show to highlight, but these girls are all fantastic in their roles, from Gayle Rankin’s She-Wolf to Ellen Wong’s Jenny. This show should be added to everyone’s binge list and gets an 8.5 out of 10.